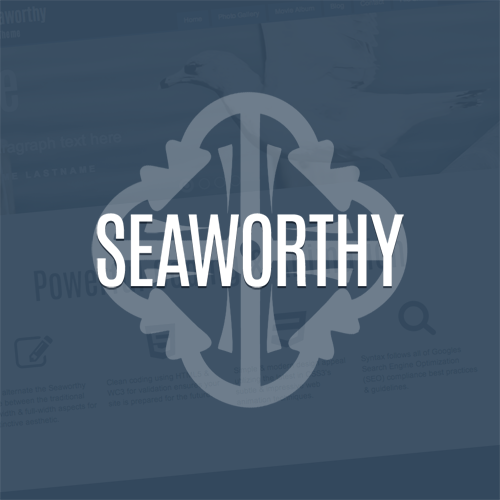 Seaworthy offers a plethora of unique styling controls. Let us go over each option in further detail. 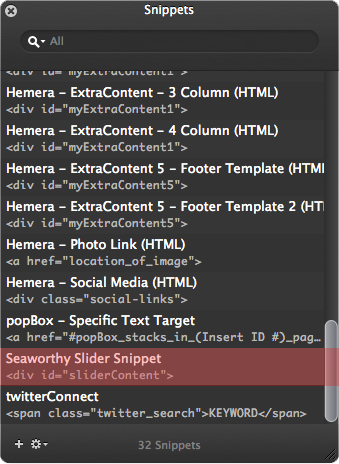 Locate the Seaworthy Slider Snippet on the Snippets section of RapidWeaver. You can also copy and paste it from below. Further examination displays the code for the slider. Each sub-div within the sliderContent div registers as one slide for the slider. Apply another sub-div for two slides, and so forth. data-image-name: Insert the name of the image file on this section from the “Resources” section. *data-split: This determines the transitioning animation for each slide (See below for all types of animations). 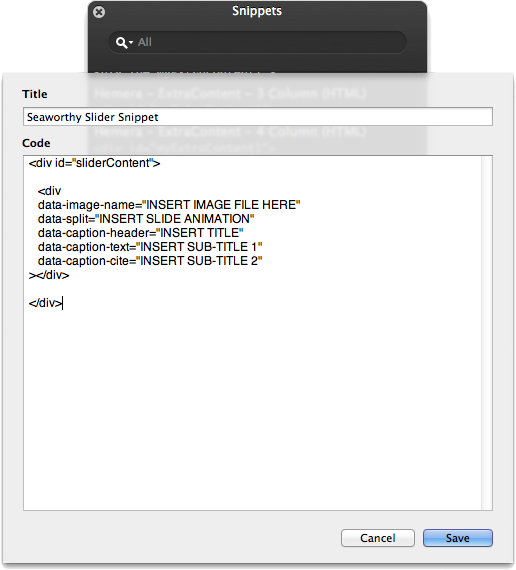 data-caption-header: Adjust the header for each slide. data-caption-text: Adjust the middle text for each slide. data-caption-cite: Adjust the bottom text for each slide. 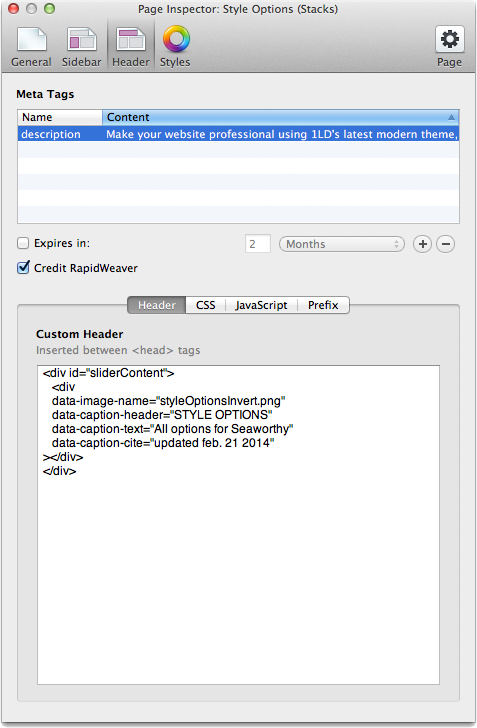 Attach the snippet onto the Header of the Header section of the Page Inspector. Refer to the image above for reference. At this point, your slider is active and ready for previewing. Remember to adjust the size of the slider on the Style Options section, since the default option for the slider is set to None. 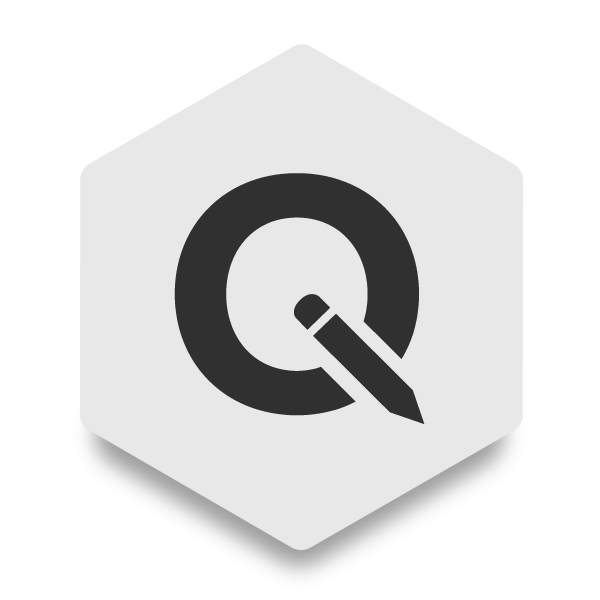 Note: RapidWeaver’s auto formatting will sometimes change straight quotation symbols ” into curly ones “. Curly quotes do not work inside HTML code. In order to replace the curly quotes with the correct straight quotes you can select and delete them and then retype them in. Alternatively, whenever you apply “Ignore Formatting” to HTML code it will automatically change the curly quotes to straight quotes. Header width determines the total width of the header. Alternate between the traditional 960px or full width header. Footer width determines the total width of the footer. 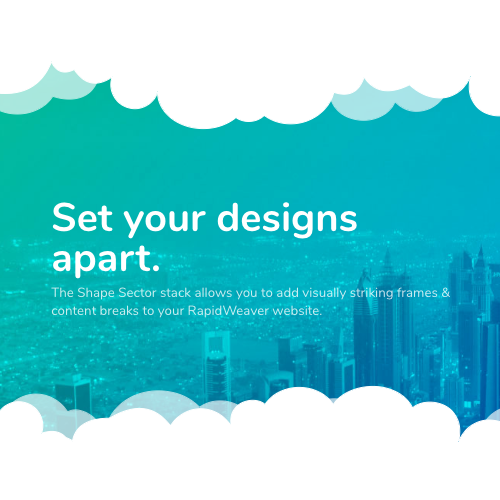 Alternate between the traditional 960px or full width footer. To omit the footer, select “None”. Page Title/Description width determines the total width of the page title & description. Alternate between the traditional 960px or full width sizes. To omit the page title & description, select “None” (Applies to all pages involving the page title & description). 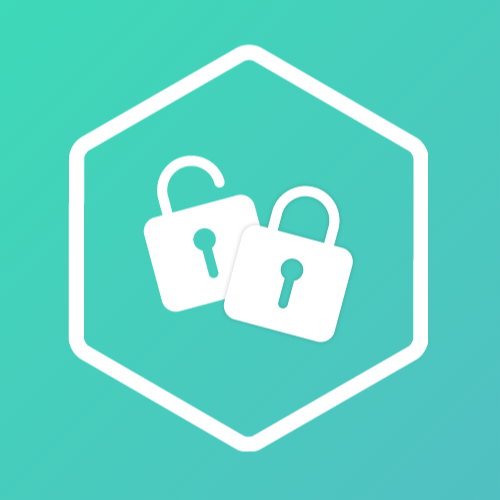 Presentation Style allows the user to display their photos, movies, and miscellaneous files in either a gallery or list fashion (Applies to Photo Gallery, Movie Album, and File Share pages). Adjust the Lightbox Icons to either a light or dark color (Applies to Photo Gallery page). Adjust the size of the movie preview. Sizes are based on sizing options for Photo Gallery image previews in order to regulate page consistency (Applies to Movie Gallery page). Slider options dictate the overall styling of the slider. Adjust the size of the slider. User has the ability to alternate between the traditional 960 or full width, as well as the overall height of the slider. Position the caption text to the left, right, or middle of the slider. Mobile options dictate styling for the mobile navigation menu. (Viewable only on mobile devices). Enable shadowing for depth purposes. Adjust the navigation highlighting to either a light or dark color. Enable max width for area within the Extra Content stack, overriding the page’s base width value. Adjust the font for the general content text. Adjust the font for the page title. Adjust the font for the site title. Adjust the font for the site description. Adjust the font for heading text (h1, h2, h3, etc. ).